In this article I would like to present four ways the legacy of these attachments get lived out in our later relationships with significant others. The four repetitions I will be addressing are as follows: (1) The longing for missed early attachment/emotional dependency needs; (2) The dread of a repetition of the failure and rupture of the original longings; (3) The tendency to do to others in relationships in adult life, what has been done to us in our early attachments; and lastly, (4) The tendency to elicit from others, in adult life, the very responses we most dread. I call these four aspects of repetition: longing for, dreading from, and doing. Let’s take a look at how these four repetitions might be expressed. Imagine developing a new romantic relationship. At first, the hope is high that this person will be someone that will meet the unmet needs for attachment, love and caring. We often hear young lovers say they just feel good and special in the other person’s presence. Almost as if they are more in love with the way they feel around the other person, than with who the person is. Here we often see that longing and need distort the perception of the other person, into the longed for and needed other, and selectively exclude, or down play, aspects of the other that do not fit these longings. We feel this person will be what we need them to be, rather than who they really are. I have asked adults coming to therapy for couples/marital difficulty, if they noticed these “undesirable” traits they now complain of, early in courting, and they often reflect back and recognize them in retrospect, but say that they just didn’t focus on them during courting, or tended to not let in this information. In other words, they wanted their loved one to be the person they needed them to be. The person who would meet the unmet longing, left over from early attachment which still influenced perception. This would represent the longed for aspect of the repetition compulsion. Sometimes it doesn’t take long before this illusion crumbles. We begin to dread a repetition of the failures and ruptures from childhood attachment figures being reenacted with this significant other in the present. Now we often feel both longing and dread mixed together. This is because we are now struggling to make them into what we need, even though we fear they will now disappoint and hurt us just as we were originally hurt. We feel a kind of apprehension and dread, as well as longing. This often evolves into ambivalent feelings toward the needed and dreaded other. We vacillate between yearning for them to meet our emotional needs, and distancing from them in fear of a repetition of emotional pain. This period of the relationship can become an intense and painful struggle between longing and protective strategies. The third repetition experience is the one in which we begin to behave toward our mate the way we ourselves were related to when we were needy and longing for contact and connection, responsiveness, and receptivity. We may shut them out, act distant, be controlling, be emotionally unavailable, etc., just like our own attachment figures where to us. We do to others what had once been done to us. This was our role model and we may unconsciously repeat this by doing the same to others to whom we are close. In this way, we may get others to feel the very same frustrated, hurt and painful way we did as children. This can be cause for tremendous distress in our relationships. Lastly, and maybe the most difficult repetition to recognize is that of eliciting from others, the very responses that we dread and fear to get. This is often very difficult to recognize we are doing, since it seems so contrary to what we consciously want. For example, we fear someone will reject and abandon us, so we withdraw and protect ourselves by distancing. Our spouse then experiences this as painful and rejecting of them, and they finally begin to withdraw and move away from us. The very thing we feared. Maybe we constantly are suspicious, and this then becomes too much for the partner and they start to withdraw and lean emotionally on others. Or we fear our spouse is too needy and we create rigid boundaries and personal space which triggers more intense longing and distress in our spouse which leads to more neediness. I could go on, but I think you get the picture. I don’t mean to imply that we do these repetitions consciously, or even intend to repeat them. They are so ingrained that sometimes we don’t even know we are doing them. There are probably many I have left out, and there may be different patterns from different caretakers, but I hope this suffices to express the kind of intense longings and fears repeated in adult life, from failures and ruptures of attachment with our caretakers carried with us from earlier in life. Perhaps in a future paper I will discuss what we can do to repair these ruptures, so that we have less repetition and distress in our relationships. 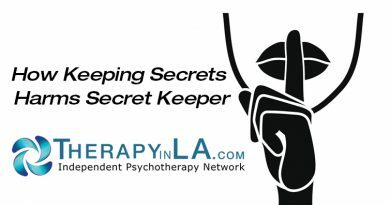 Dr. Lance is a psychotherapist in practice in the Pasadena/Glendale/Burbank area and is a member of the Independent Psychotherapy Network. He can be contacted at (818) 265­4052 or jeffworks@earthlink.net.